Sweet Charlie strawberry plants are a vigorous, early-season variety. 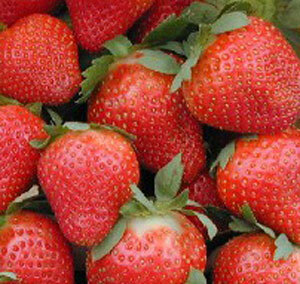 They generally produce 7 to 10 days earlier than Chandler strawberry plants. This variety has a naturally sweet flavor right off the bush. All our 'Sweet Charlie' Strawberry Plants are organically grown and shipped in fine quality growing medium. They are guaranteed to arrive alive and ready to plant. Comment: Ordered Sweet Charlie Strawberry plants this September. I was a bit late in placing my order, as the ones I wanted were sold out, An email to GrowJoy received a quick reply as to which plants they still had in stock. Order came when promised, packaged well. Plants were healthy and soil was still moist and ready for planting, though I still gave them a quick soaking prior to planting. Comment: It is pleasure to be Your Customer - plants came to my in great condition - fresh and healthy. Thanks to You. I will be Your customer in future. Comment: My Strawberry plugs arrived quickly and in perfect condition. They settled in with no shock and after a week I see new leaves sprouting nicely. This is the second season I have ordered them and am very happy and will order again. Comment: Sweet Charlie Strawberry plants arrived quickly and healthy. No issues, will order from again. Comment: This is the second year we have purchased the Sweet Charlie strawberries to start up our hydroponics system in South Florida. Last year they exceeded our expectations, yielding 1-2 cartons of strawberries a week. The plants arrived in great condition, this year we even received and extra plant. It has been over a week and all plants are still alive and rooting in our hydroponics system. Comment: We were very pleased with the Sweet Charlie Strawberry plants we ordered. They arrived promptly as stated. They plants were very nice. We planted and have been watering as instructed. We now look forward to our first crop! Thanks for great service and products. "Beautiful Sweet Charlie Strawberry plants!" Comment: The plants I received are more than healthy and packaged perfectly when they arrived. I'm confident that I will have tons of Deep Red and juicy strawberries next year and even more in the years to come!